Mark Twain’s famous expression isn’t exactly true at Noble, where the Company is in the forefront of addressing extreme work-related weather concerns from the Arctic to the Equator. 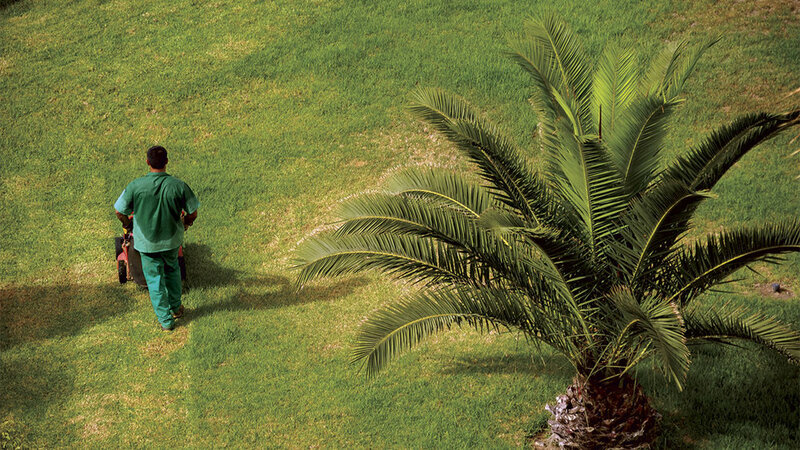 In the Middle East, for example, heat stress is a major challenge for workers who are engaged in outdoor activities. This can be particularly important for team members who spend hours in temperatures that could lead to ailments such as stroke, cramps, rashes and exhaustion. Starting in April each year, daytime temperatures in the Middle East can easily reach 120° F (49° C). By the end of September, it starts to cool down – to around 95° F (35° C). 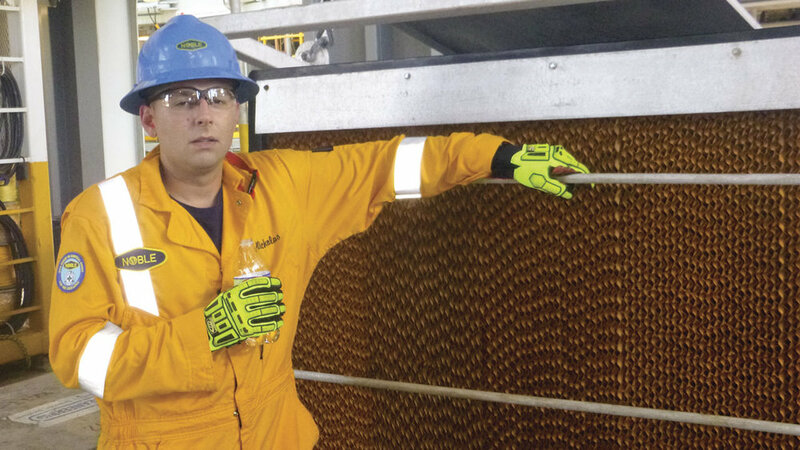 Working in these conditions safely means paying special attention to a number of factors – with proper hydration topping the list. “Heat stress can be a significant hazard in our operations and we are constantly raising awareness of our crews regarding eating and drinking habits,” says Odis Cobb, HSE Supervisor, Middle East. “We encourage our people to stay ahead of dehydration issues by drinking a three to one ratio of electrolytes to water as early in the day as possible. “For the members of the crew who observe Ramadan and fast during the day – we take the added step of facilitating them working on night shifts to further reduce risk. In addition, we have huge fans called blowers that can provide much needed ventilation to cool off,” Odis adds. Beyond personal wellbeing, even mild dehydration leads to deterioration in short-term memory, simple visual orientation, simple arithmetic, and complex motor coordination. For this reason – individual crew members also play an important role in protecting themselves from heat stress. There are three basic types of heat-related illness: heat cramps, heat exhaustion—and the most serious—heat stroke. Heat cramps occur mostly in the muscles of the legs, often causing severe pain and spasms. Intense exercise and sweating in hot temperatures can initiate these cramps. Fortunately, the treatment is simple. Find a cool place, rest and drink plenty of fluids, especially sports drinks, like Gatorade. In most cases, the cramps eventually subside. Dehydration can also cause heat exhaustion. Along with heavy sweating, symptoms include dizziness, weakness, nausea, extreme thirst, anxiety and sometimes a low-grade fever. Treatment for heat exhaustion is similar to that of heat cramps, but should be sought more urgently. If your condition does not begin to improve after moving to a cool place and drinking fluids, seek medical help. The most dangerous heat-related illness is heat stroke, which is also life threatening. Heat stroke occurs when the brain cannot properly regulate body temperature under extremely hot and humid conditions. When body temperature rises rapidly over 105 degrees an individual can lose consciousness and slip into a coma. Unless heat stroke is treated immediately, it can be fatal. “It’s very critical that each person watch out for each other and when they see their buddy showing signs of heat stress, talk to them and support them to take action,” says Michael. “We have a tendency to be macho out here sometimes and heat stress is nothing to mess around with. “Everyone knows their own body and their tolerance for heat. We encourage everyone to know their own situation and be smart about what they are taking into their bodies. For example many people take supplements and medicines for many different reasons. These can increase your need for water making you dehydrate quicker and/or even speed up your heart rate,” Michael adds. Noble employees living in the southern United States can attest, summers can be brutal. The hot, humid conditions are not only tough on gardens, but also on gardeners. When people are exposed to extreme heat, they can suffer from potentially deadly heat-related illnesses, such as heat exhaustion and heat stroke. Heat is the leading weather-related killer in the United States, even though most heat-related deaths are preventable. Importantly, many of the heat-related emergency room visits relate to non-work activities such as keeping yards or summer sports exertion. When you are looking at the seven-day forecast hoping to see a rain cloud, pay careful attention to the heat index. The heat index is the “feels like” temperature which combines the effect of the air temperature and relative humidity. Relative humidity above 60 percent hampers sweat evaporation and reduces the body’s ability to cool. Remember that heat index is higher in full sun than in shade, so try to work in the shade whenever possible. Heat-related illnesses always are a concern in summer – not just during record-setting heat waves. Prevention always is preferable, so plan yard work to minimize risks. However, it also is important to know the symptoms, and immediate treatment options for early signs of heat stress to protect you from a potentially life-threatening problem. The key to preventing heat exhaustion is to plan your outdoor work. It should be timed early in the morning or early evening whenever possible when the sun is less intense and temperatures are not at their peak. This may be a change in habit for those that have relocated from cooler climates. Light colors reflect light and heat. Dark colors absorb heat. Loose-fitting clothes allow for more air circulation and better sweat evaporation. A wide-brimmed hat always is a good option. Light colors are preferable. Straw and ventilation holes also help to keep your scalp cooler by increasing air circulation. Neck flaps also are a good way to protect the back of your neck from sunburn. Before, during and after outdoor work. Replenishing fluids is critical. Water is the best option, with sports drinks a good option if you are worried about salt depletion. Avoid caffeine and alcohol. Plan your yard work around shade patterns. Do as much outside work that is limited to sunny areas as early in the morning as possible. Delay outside chores that can be done in the shade until later in the day. If natural shade is not available, you can make your own. Beach umbrellas can provide temporary shade that can be moved. Realize that umbrellas can blow over in windy conditions, so keep that in mind to prevent other injuries while trying to prevent heat related illness. There are two types of heat exhaustion — water depletion and salt depletion. Symptoms of water depletion include excessive thirst, weakness, headache and loss of consciousness. Also note that dark-colored urine is a sign of dehydration. Salt depletion is noted by nausea, vomiting, frequent muscle cramps and dizziness. If not addressed, heat exhaustion can lead to a heat stroke which can damage the brain and other organs. Treatment. If you find yourself feeling dizzy or have other signs of heat exhaustion, take action immediately. Get out of the sun and sit down. Apply water to the skin by washing the face, taking a cool bath or shower, or by applying wet compresses to reduce body temperature. Increasing air circulation with a fan also helps to speed up water evaporation from the skin and naturally cools the body. Also, drink water or a sports drink to replenish water and salts. If symptoms don’t improve in 30 minutes, seek medical help immediately. Whether at home or on the job, the key to working safely in hot weather is to learn to recognize the causes of heat-related illnesses. Identifying and responding to early symptoms can protect you, your team members, your family and friends.